Alicante airport disposes of 3 parking areas which are reserved for public clients, and conveniently situated on the airport premises: general parking contains genaral car park P1 and First class car park, Long-stay car park, and Express car park. The airport does also dispose of one parking area, reserved for car rental companies, and one parking-bus station exclusively reserved to tour operators and private transfers and shuttle companies, from the airport to any hotel, address or town, booked online in advance. There is also a wide offer of low-cost car parks, close to the airport of Alicante, with all kind of services and transfer facilities. Introduce your travel dates in the attached table and compare prices from multiple airport parkings in Alicante airport. Guarantee best price and your parking space. Located in front of the terminal NAT, this parking is often used for shortly trips, less than 4 days. It disposes of 2.600 parking spots distributed over six floors. Also disposes two parking slots for passengers with reduced mobility PRM: at the parking south hall and at the parking north hall. As soon as you paid the corresponding amount, please withdraw the evaluated ticket; You are only given 15 minutes to leave the car park. Minut 2 to 30: €0,020687 per minut. Minut 31 to 60: €0,035994 per minut. From minut 61 onwards: €0,037636 per minut. Max/day up to 4 days: €19,00. Max/day from the 5th day: €15,00. Fill your travel dates in the attached form, and compare prices from multiple airport parkings in Alicante airport. Guarantee best price and your parking space! *The tariffs of the public parking areas at Alicante airport are subject to Aena and can vary without prior notice. This parking is often used for long trips, more than 4 days, or vehicles more than 2'10 meters high. Located at the airport premises, few minutes to the terminal. It has two road access, one for vehicles up to 2'10 meters high, and another one for highers. It disposes of 1.640 parking spots. Discounts available booking in advance. Day 3 to 5: €8 per day. Días 8 a 12: €10 per day. After day 8, the price rate continues indefinitely, with a maximum per week of €50. Located on the fourth floor of general parking, this parking directly connects to the terminal through independent access to the check-in hall. It disposes of 390 parking spots. Minut 2 to 30: €0,024395 per minut. Minut 31 to 60:€0,042446 per minut. From minut 61 onwards: €0,044805 per minut. Located on the approach road terminal Departures level, opposite the termina, offers free of charge 15 minutes for drop off or pickup passengers. After minut 15, tariffs will apply from minut 1. It disposes of 80 parking spots. Less than 15 minutes: free of charge. Minut 2 to 30: €0,050591 per minut. From minut 31 onwards: €0,099766 per minut. Low cost parking areas, for short term and long term parkers, inside or close to the Alicante-Elche airport premises. - VIP parking with a driver who parks the car for you:A driver picks your car up and brings it back to the Alicante airport area. Access to parking surrounding the Parking P1. 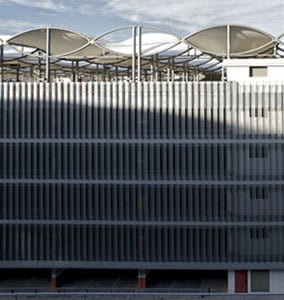 Parking spaces intended for agencies rental vehicles are distributed throughout the six floors of the car park. See the indicative distribution of plants at the entrance of the enclosure. The bus station is located on the ground floor of the terminal NAT on the outside. This car park is intended for bus and coach tour operators, agencies and vehicles of private transfers and / or shared (shuttle) to stop and pick up passengers who have purchased their reservation online. See the section of private and / or shared transfer (shuttle) from / to Alicante airport to your hotel, home or destination around Alicante.